While you quietly sip a beer this month, it’s more than likely that Judy Parent and Erin Harding are painstakingly picking out leaves and stems from the Oregon hops that might be an ingredient of that brew. 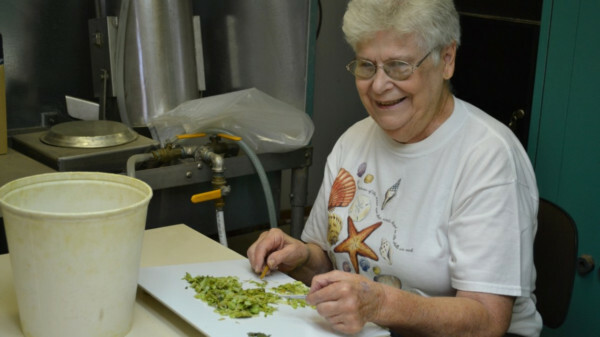 The two women aren’t necessarily cleaning up the hops but, in fact, inspecting samples of this year’s harvest for seeds, leaves, and stems– the undesirable elements of hops. Each “lot” of hops grown in Oregon is sampled and inspected for seed, leaf, and stem content. That’s the job of a close-knit team of inspectors– some of whom are retirees who have already given years of full-time service to ODA in other jobs. Now they work hard and fast, but only in August and September after hops are harvested. Once inspected, the grower receives a certificate for that lot. The sale to the brewer is based on that certificate. The lower the percentage of seed, leaf, and stem, the better the price of the hops. ODA inspectors are considered third-party participants. They don’t take sides in the process, but merely determine the percentage. Each sample is identified by a number corresponding to the appropriate grower. Most of the hops come from nearby fields as a majority of the crop in Oregon is grown in the area between St. Paul, Woodburn, and Mt. Angel. The Salem-based “inspection facility” is not some kind of high-tech clean room with white tables and antiseptic walls, but it is appropriate for what needs to happen. Up to a half dozen inspectors gather daily during the season to do what they do best– picking through the hops with tweezers in search of leaves and stems. “It’s a fairly easy job to do and just a matter of looking closely at the hops to be sure you pick out all the leaves and stems from the sample,” says Parent, who has come back every summer for 15 years to help out. This is after three decades of service to ODA as the agency’s payroll coordinator. The inspectors typically pick through between 80 and 110 grams at a time after the hops have been put through an eighth-inch screen to remove the fine debris. Once all the leaves and stems have been removed from the sample, a percentage is determined after the hops are reweighed. A separate process is designed to find seeds. A sample that is between 40 and 60 grams is baked for two hours at 118 degrees. After baking, the sample is threshed until individual seeds remain. They are counted and another percentage is calculated. It all sounds like an old-fashioned recipe for some unique brew. In fact, the only thing cooked up are some numbers and percentages that translate into the price of the crop– something important to both grower and buyer. The 2016 crop appears to be average quality. Warm spring temperatures led to some early bloom for certain aroma-type hop varieties, but the mild July helped to steady the growth. With the arrival of a booming craft brewing scene in Oregon, the rest of the US, and internationally, the world of hops has changed a bit.